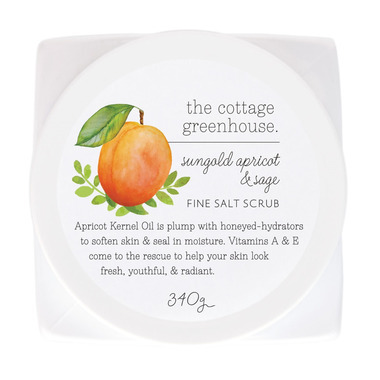 The Cottage Greenhouse's stimulating spa-to-go scrub has never been sweeter! Hydroscopic Honey (fancy word simply means Honey attracts & holds moisture!) helps soften and soothe your skin while nutrient-rich Blueberry Oil wages war against the aging effects of environmental stress. Our luscious formula finishes with smoothing Cocoa Butter and golden Apricot Kernel Oil to replenish moisture. 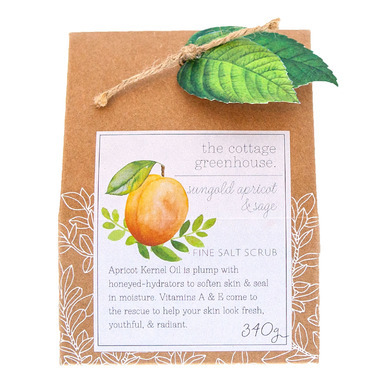 Small granule Sea Salt combined with the polishing power of Passion Fruit Seeds slough away sluggish surface cells to reveal your super smooth skin for a happy, radiant glow. Ingredients: Sea Salt, Glycerin, Water, Propanediol, Cetearyl Alcohol, Fragrance, Ceteareth-20, Butyrospermum Parkii (Shea) Butter, Caprylyl Glycol, Passiflora Edulis Seed Powder, Caprylhydroxamic Acid, Aloe Barbadensis Leaf Juice, Honey, Prunus Armeniaca (Apricot) Kernel Oil, Theobroma Cacao (Cocoa) Seed Butter, Vaccinium Corymbosum (Blueberry) Fruit Extract. 98% Natural, Paraben Free, Phthalate Free and Never Animal Tested.